This section contains information related to Transavia, flight code HV, a low-cost carrier full-service type. "Transavia is a Netherlands based low-cost airline operating as an independent part of the Air France-KLM group. Schiphol International Airport (AMS), Amsterdam is its main base while Rotterdam Airport (RTM) is its secondary hub. transavia.com chiefly operates scheduled and charter services to leisure destinations." Click to view the whole Wikipedia article in a new window. Former Basiq Air is owned by Transavia Airlines. 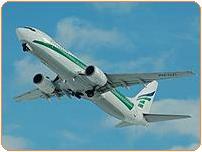 Click to browse to the network development section of this site, featuring more more information on the network development of Transavia.